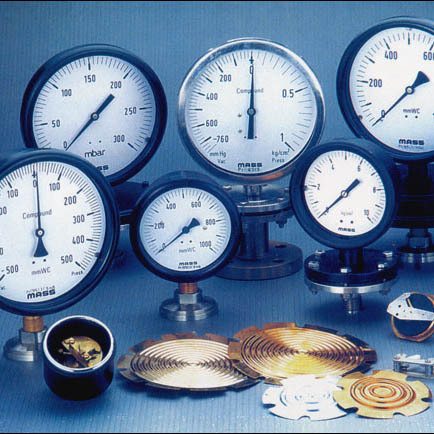 Diaphragm gauges are suitable for measuring pressure of all kind of fluid and gaseous medium. The measuring element is a sensitive corrugated diaphragm fixed between two flanges. For slurry and viscous liquids flanged connections can also be incorporated. Low Pressure Bellow Capsule Gauge are designed for non-corrosive and non-aggresive application. These Gauges have bellow capsule which is composed of two corrugated metal discs of Brass / Stainless Steel joined by brazing / argon arc welding. A rise pressure will cause the corrugated Capsule / Diaphragms to expand and this motion is transferred to the indicator through sector, pinion movement mechanism. A similar type of low pressure built-in capsule gauge can also be offered having almost similar kind of mechanism. Accuracy 11.5% and+2% of the f.s.d. Diaphragm:S.S.316 / Teflon or Silver protected. Case & Bezel Die Cast Aluminium Weatherproof housing, with screwed outer bezel, stoved enamel black finish. M.S. Powder coated or 304 SS snap action bayonet type. T type flanges & Direct Flanges. As per ASA, ANSI, BS & DIN Standard. Optional Features Special graduation and range on dial, other thread connection and anti-corrosive epoxy coated black paint can be provided. Range -760 mmHg Vaccum and up to 21 Kg/sq.cm for diaphragm type " D " model & from 250mmwcUpto 10,000 mmwc for low pressure diaphragm type " LPD " model. Accuracy + - 2% of f.s.d. Case & Bezel Stainless Steel / Mild Steel with powder coated. All Low Pressure Diaphragm models start with suffix" LPD ", Diaphragm type model start with suffix 11 D " and Compact Capsule type model start with suffix " CC " Follow decodification sheet for details.